European Council President Donald Tusk holds up the document from the U.K. in Brussels on Wednesday. 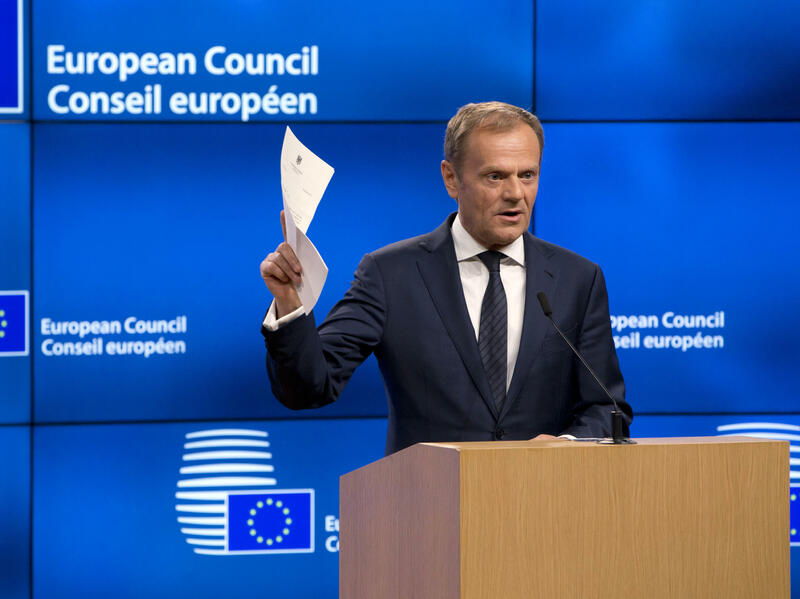 Tusk has received a letter from British Prime Minister Theresa May invoking Article 50 of the bloc's key treaty, the formal start of exit negotiations. 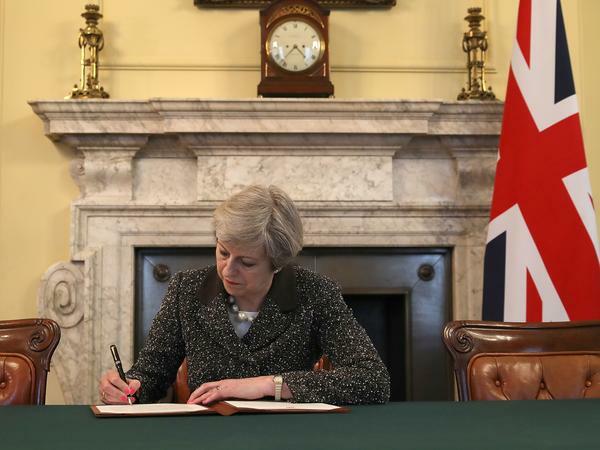 Britain's Prime Minister Theresa May signs the official letter to European Council President Donald Tusk invoking Article 50 and signaling the United Kingdom's intention to leave the EU. Today the United Kingdom formally told the European Union it is leaving, after decades of membership in the 28-nation political alliance and trading bloc. The move triggers an estimated two-year divorce process that will involve many months of tough negotiations and will launch Britain on a new, uncertain path. Addressing the House of Commons in London, Prime Minister Theresa May said Brexit is an opportunity for her country to chart a new course, unencumbered by the bureaucracy of the multilateral organization based in Brussels. "This is an historic moment from which there can be no turning back," said May. "We're going to make our own decisions and our own laws. We're going to take control of the things that matter most to us." Britain's feisty press captured the ambivalence of the U.K. people, who voted 52 percent to 48 percent last June to quit the EU. "Freedom!" crowed the Daily Mail, the conservative tabloid. The left-leaning Guardian ran a map of Western Europe as a jigsaw puzzle with the pieces of the U.K. taken out. 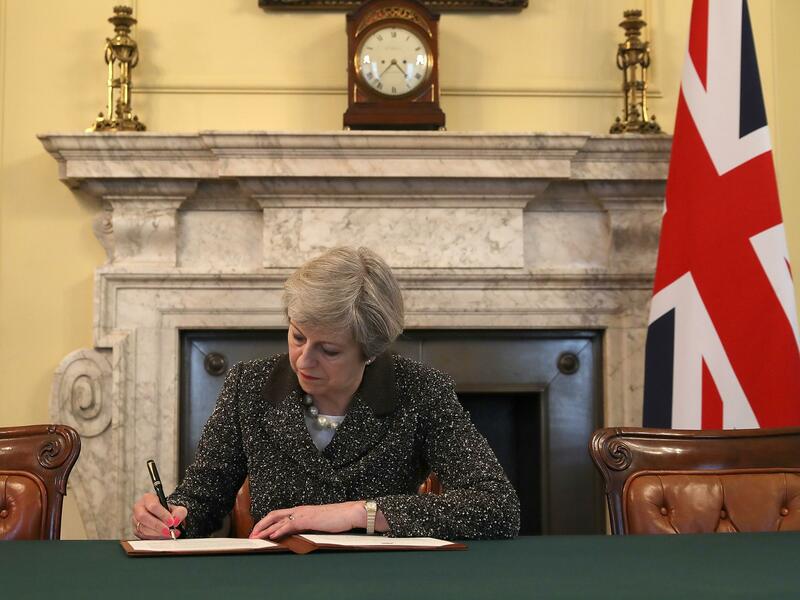 In the empty white space that remained were the words: "Today, Britain steps into the unknown." While May tried to strike a confident tone, many who voted to remain in the EU fear Brexit will damage the country. "I feel rather concerned and worried about it, really," said Linda Roberts, 68, as she waited at London's Euston station earlier this week for a train home to the north of England. Roberts said many people voted to leave the EU because they were unhappy with the free flow of immigrants into Britain that EU membership required, and hadn't thought through the broader implications. She worries Brexit will impose a huge opportunity cost on many young British citizens, including her own daughter. Coming from outside the EU, they are unlikely to be able to work visa-free in European cities like Paris or Barcelona. Roberts' daughter is in advertising, said Roberts, "and a lot of the work is abroad. I know they say [Brexit is] opening up everything. Well, we're already opened up to the rest of the world. Actually, we are just cutting off Europe, which I think is a big mistake." Pro-Brexit sentiment has strong parallels to the political climate in the United States, where President Trump has criticized the European Union, shunned multilateral trade deals and declared an "America First" agenda. In fact, Trump was a big supporter of Brexit and called himself "Mr. Brexit" during his presidential campaign, correctly predicting he would pull off a similar upset in November's election. As in the U.S., immigration and rural resentment also played a role in the Brexit vote. "There is a sense, certainly amongst the rural parts of the U.K., that they feel London and the elites running the country are part of a globalist conspiracy," said Christoph Meyer, a professor of European and international politics at King's College London. "That is something you see in other countries as well, the sense that local, national identities are seen as threatened by markets and by immigration." The British are known for understatement, but political observers here speak of Brexit in superlatives. They say it could prove transformational for the country – for good or ill. Although the British economy has held up well so far, British people are already poorer as the value of the British pound remains 16 percent below its high last June. "Brexit is a weird combination of looking at the  global financial crisis and knowing it is going to happen ... blended in with a kind of Suez Crisis," said Robin Niblett, the director of Chatham House, the London think tank. The 1956 Suez Crisis erupted when Britain and France invaded Egypt to take back the Suez Canal, only to have a far more powerful United States force them to withdraw. It was seen as a major milestone in the continuing decline of the British Empire. "At that moment, we were suddenly discovering that we couldn't keep empire — that the United States was coming up and becoming the big kid on the block," said Niblett. "It required a real redefinition of self — not just of the British government, but the British people." Not unlike where the United Kingdom finds itself today. After Brexit, Britain will have to define itself independently and outside of the European Union, where it has enjoyed far more economic bargaining power as part of the world's largest collective market. Niblett said Britain may choose to see itself through the lens of its national mythology — as a plucky island nation off the coast of Europe with global ambitions, punching above its weight. "If it can get a good deal with the EU, then Britain can — in a way — have its cake and eat it," said Niblett. Even as it turns its back on the European Union, the U.K. wants to maintain as much access as possible to this huge single market. But with 27 nations, the EU will have far more leverage than the United Kingdom in the coming negotiations over a new trade deal. "There is very little incentive for the current EU member states to give the U.K. a great deal," said Meyer. "If the U.K. was able to go home and say, 'This is a political victory,' that would be seen as a threat to the rest of the EU because it would encourage populist movements." There are populist movements in Europe, like Marine Le Pen's National Front in France, that want to pull out of the EU as well. Meyer says the last thing the EU needs are populists looking at a future U.K.-EU trade deal and saying, "Look, it's not so bad."